Mophorn Stainless Steel Work table 24 x 24 Inch Food Work Prep Table Work table for restaurant kitchen Home Warehouse by Mophorn at Momiji Studios. MPN: Work table. Hurry! Limited time offer. Offer valid only while supplies last. The Stainless Steel Work Table is certified to meet strict standards for public health protection and built for high-volume use to last a lifetime. The Stainless Steel Work Table is certified to meet strict standards for public health protection and built for high-volume use to last a lifetime. It is made of 430 Non-magnetic stainless steel,and is the perfect work surface for use in a kitchen, bar, restaurant, laundry, school, hospital, or any other commercial setting.This product is designed and finished for use in a commercial environment. Therefore surface imperfections such as scratches, scuffs and indents may be found. 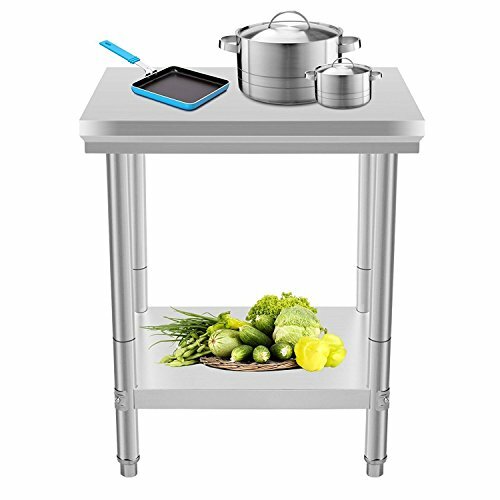 The Prep Work Table is made of 430 Non-magnetic stainless steel,which is very strong and durable. Table Thickness: 2" Shelf Thickness: 1.5"
NSF certified stainless steel work table.Constructed from heavy duty 18 Gauge 430 stainless steel. The stainless steel work table has adjustable legs and non-marring feet, it will not hurt your floor.Fast and easy assembly. This Prep work table fit for kitchen, bar, restaurant, laundry, school, hospital, or any other commercial setting.